and the release of several new Phyllis Harris stamps! to say "hello" before you leave each blog! 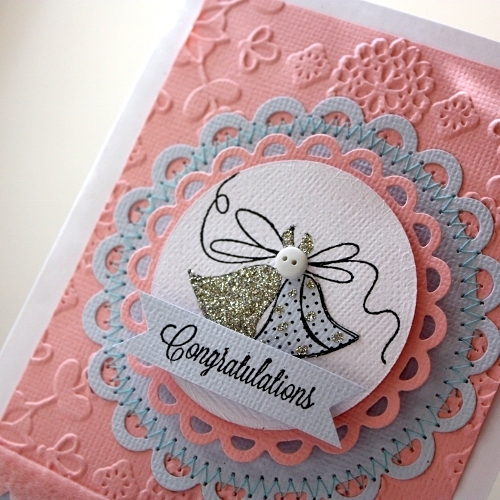 I was so excited to try out my brand new polka dot embossing folder from Lifestyle Crafts! And I just happened to have the exact size circle punch for the touch of black. to the white paper with foam dots. I love these wedding bells...they're so nostalgic and remind me of a 1950's wedding. I stamped the bells onto a white and light blue textured cardstock by American Crafts. to dot a couple of the areas with glitter on the other bell. Enjoy all of the Unity goodness and great deals today! Both cards are fabulous, Shellye. The first design is very striking! Beautiful cards. Love the pink one. 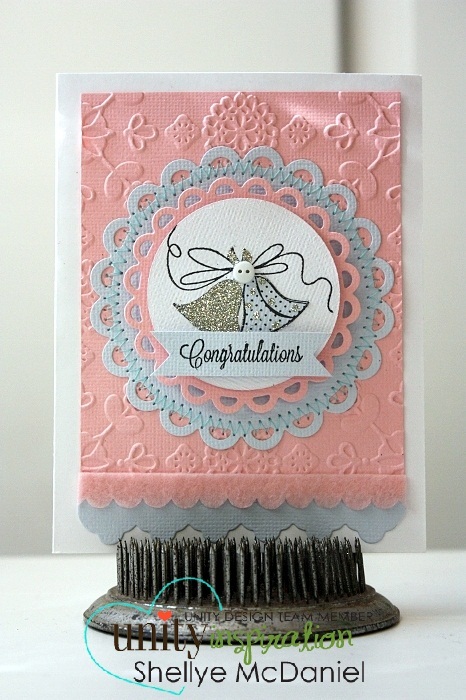 Love both cards...all the detail, just fabulous! Wonderful cards! Love the red glittered lips! so fun! and love what you did with the bells on the second one. Both cards are awesome but I really like the lips! I especially like the wedding card, so pretty! Wonderful cards! I especially like the first one, love how CAS it is, but I really love the detail at the bottom with the twine and pearls. Great cards! I love the glittery lips and fun embellishments on the first, and the layering and pretty wedding bells on the second! Cute cards - great inspiration. I love that black and red card-very striking! Both cards are awesome! I really like the wedding card. Do you ever do anything that is not cute?!? Seriously love your cards - every one always has a little something to make it pop!! Thanks for all you share here on your awesome blog! I love how you glittered these up! Awesome! Wonderful cards! 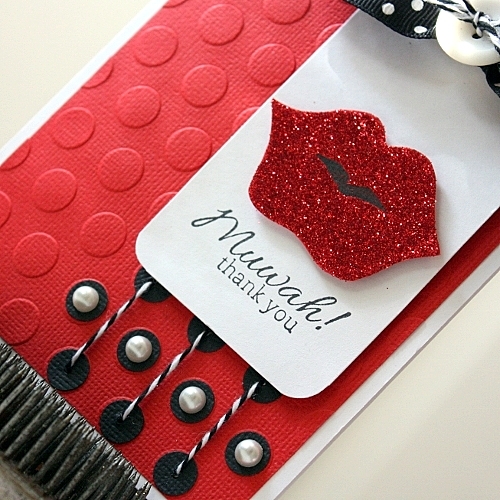 Love the red, black & pearls! The wedding card is so pretty! LOVE them both - but that first one is so striking! LOVE the red lips!!! love the lips! great cards. Two very different cards. Love the red/white & black on one side. The other card is so soft. Love them both! Pink and blue for a wedding card great colors. Love them both. Both truly great cards but those red lips are divine! These are both beautiful!!! Wow! Everything about your first card is WOW! 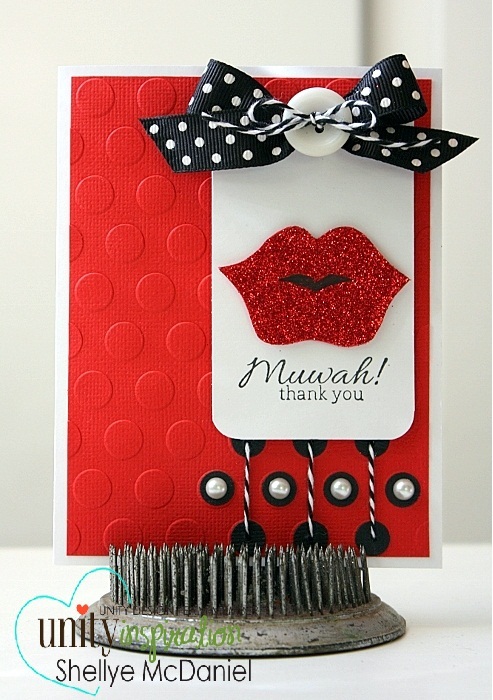 The dotted background, the bow, and then those glittery red lips!! Both cards are wonderful! I really love the wedding card, those bells are so sweet! TFS God bless!! Both cards are so pretty ! !